EcoWise is a column that appears periodically in the News of Pelham (newsofpelham.com) newspaper distributed by subscription and through the Kravitz Real Estate office on Wolf’s Lane and various stores around town, such as DeCiccio’s Supermarket. In this season of graduations and summer celebrations, it’s a good time to think about alternatives to that most popular of party decorations: balloons. Unfortunately, balloons are harmful to the environment on three fronts. First, just like single-use plastic bags and straws, discarded balloons – particularly those that are released into the air — make their way into the environment where they do not biodegrade. Pieces of balloons have been found nearly everywhere – including in the digestive tracts of animals, blocking their ability to absorb nutrients and slowly killing them. The texture and color can be particularly deceiving for marine animals, which can mistake them for food. Second, balloon strings and ribbons can prove dangerous to animals, who routinely get tangled in them. Third, party balloons are often inflated with helium, which is not a renewable resource and has more important uses, such as in the treatment of emphysema, the production of MRI scans and the manufacturing of semiconductor chips. Unfortunately, balloons that are not made of plastic also miss the mark. Mylar, which has become a popular material for making balloons, comes with its own environmental hazards. Made of synthetic nylon with a metallic coating, it is not biodegradable. Also beware of the many stores and sites that market “biodegradable” latex balloons. While natural latex is biodegradable, by the time the latex is treated with chemicals, plasticizers and dyes, the final product’s biodegradability slips. During that time, these so-called biodegradable alternatives can do plenty of damage to the environment. Tissue paper flowers: These are easy to make and can be created in as much variety as there are colors of tissue paper. Pinwheels: Part of the fun of having balloons at an outdoor gathering is watching them dance in the wind. Paper pinwheels can have the same effect without the environmental hazards. Kites: If you’re tempted to do a balloon release, think of flying kites instead. It’s another way to get that uplifting feeling – but in an eco-friendly, reusable manner. Flags: String small paper flags across the party area and watch them flutter in the wind. Crepe paper: Crepe paper can be used in a number of different ways, not just as streamers. 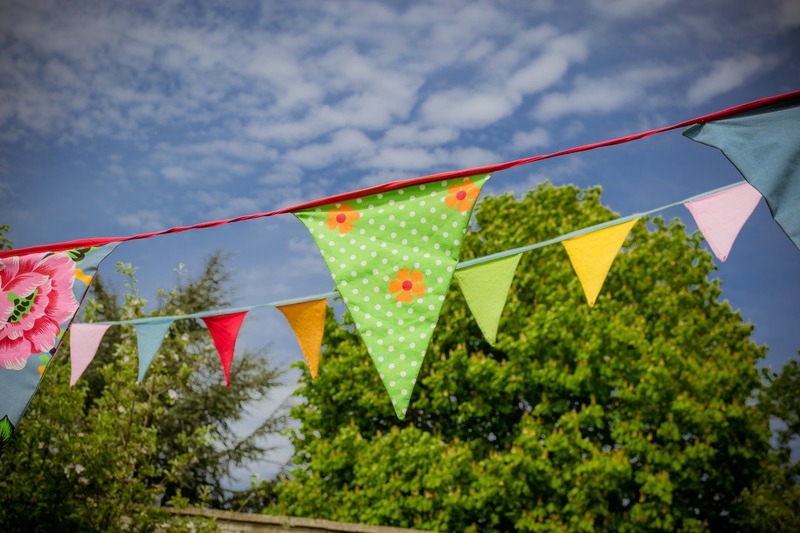 Bunting: Bunting can be made out of a number of materials, from construction paper to fabric, and it’s an interesting way to tie a party theme into whatever you create. Plants: Flowering plants make for great décor and are a particularly wonderful alternative if party-goers can plant them afterwards. Painted rocks: These can be placed all over the party setting, adding color and imagination. The Internet is full of balloon-free decorating ideas that can spur your imagination. Enjoy this season of celebration, and try looking beyond balloons. Discounted solar energy is finally coming to the Town of Pelham through the Solarize Westchester program. The deadline for homeowners to sign a solar contract is June 4. The model takes advantage of economies of scale in individual municipalities to bring down the installation cost of solar for interested residents and commercial property owners. “[Solarize Pelham] is a way to be more responsible to our planet, our community, and each other,” said Town Supervisor Pete DiPaola. Since it began operation in 2015, Solarize Westchester has conducted 11 Solarize campaigns in 20 Westchester municipalities, resulting in 500 solar installations. It is currently rolling out new efforts in Pelham and Croton, among other communities. “The municipalities we worked with have been very positive about the program,” said Nina Orville, principal of Abundant Efficiency, a sustainable consulting company that administers the overall program and coordinates between municipalities and solar contractors. The selection of Pelham as a new Solarize market followed an extensive vetting process. Pelham first had to submit an application to Sustainable Westchester, which looks for a number of attributes, including whether the population is big enough to qualify for discount. Village of Pelham Trustee and EcoPel liaison Ariel Spira-Cohen coordinated the municipal application process between Pelham and Sustainable Westchester. Pelham residents Kevin Healy and Maryann Joyce worked with former Pelhamite and EcoPel board member Christian Privat to initiate the application process last year. Sustainable Westchester also promotes the opportunity to participate in Solarize Westchester with its municipal members and issues the requests for proposal to solar installers. Additionally, solar installers are pre-screened by the New York State Energy Research and Development Authority (NYSERDA). Pelham chose Ross Solar, a ConEdison Solutions Company, for the Solarize Pelham campaign, which has been the contractor for 21 other Solarize campaigns. How big are the potential savings? Excluding the long-term reduction in energy costs, once the estimated 20 percent group discount is applied, along with a mix of rebates and tax credits, the price of a solar installation can drop by as much as two-thirds off the average market price of $28,000. Payment plans are also available through Ross. An initial kickoff workshop was held on March 7, organized by the Solarize Pelham team with a presentation will by Ross. Other forums are being planned, including one focused on commercial property owners. While homeowners have until June 4 to sign a solar contract, commercial property owners can register for site visits until June 4 and wait until October to sign a contract. For more information, go to http://www.solarizewestchester.com/pelham/. The recent decision by the Village of Pelham to return to weekly from biweekly recycling pickup – after residents asked for the change in the new garbage contract – is just one indication that most households in the broader Town of Pelham dutifully recycle their plastic, paper and metal. Recycling is to be encouraged. But next time you’re hauling out your bin full of plastic bottles, you might take a moment to think about things differently. How? By figuring out how to lessen both garbage and recycling – by buying items that have minimal packaging, using refillable water bottles instead of buying the kind that can eventually be recycled, or refusing a straw with your soda. Why single out plastic? Because even after it’s recycled, it never really goes away. Virtually all of the plastic that has ever been made is still on the planet in some fashion. A plastic bottle takes over 400 years to decompose — a plastic straw about 200 years. The fact is that is the United Nations has termed plastic pollution “a planetary crisis” and there’s no sign – yet — that demand for plastic is slowing down. Some 311 millions tons of plastic is produced each year, and that amount is supposed to quadruple by 2050, according to the European Environmental Bureau. Especially given that everyday items such as plastic bags and straws can’t easily be recycled, this is not a problem that can be handled solely by recycling. While it’s unclear right now how or if this change will affect the much smaller world of Pelham recycling, the best way to adjust to an ever-changing landscape is simple: don’t just recycle, but refuse, reduce, reuse — and then recycle. One of EcoPel’s bedrock goals is to raise the environmental consciousness of local government officials in support of policies that promote a greener, cleaner Pelham. Recently, the Village of Pelham has moved steps closer to that goal as its Board of Trustees explores the creation of a sustainability advisory board (SAB). Such a body would develop programs and recommend policies that contribute to the environmental, economic, and social sustainability of the Village. Though still in the exploratory stages, the board would potentially be made up of six members appointed by the mayor with trustee approval, along with a liaison from the Village government. Sustainability members might come from like-minded civic organizations such as EcoPel. Generally speaking, sustainability boards provide non-binding advice and expertise. For instance, while residents may express interest in food-scrap composting, to put that into practice requires a relationship with local governing bodies. “We have a great civic organization here, EcoPel, but we don’t currently have a sustainability committee that is very aligned or integrated into village government like some of the other Westchester municipalities,” Spira-Cohen said. For an example of how a sustainability advisory board might work, EcoWise reached out to Steve Wolk, chairman of the Town of New Castle SAB. In recent years, it has helped establish a town-wide plastic bag ban and coordinated a shift from dual stream recycling – which requires that paper products be sorted separately from other recyclables — to single-stream recycling, which is more efficient. Pelham Manor isn’t currently discussing the creation of a formal advisory board, according to Manor Trustee Michelle DeLillo. But she noted that the Village is serious about sustainability, as evidenced by its robust recycling and waste management program that includes electronics recycling and curbside collection for leaf composting. 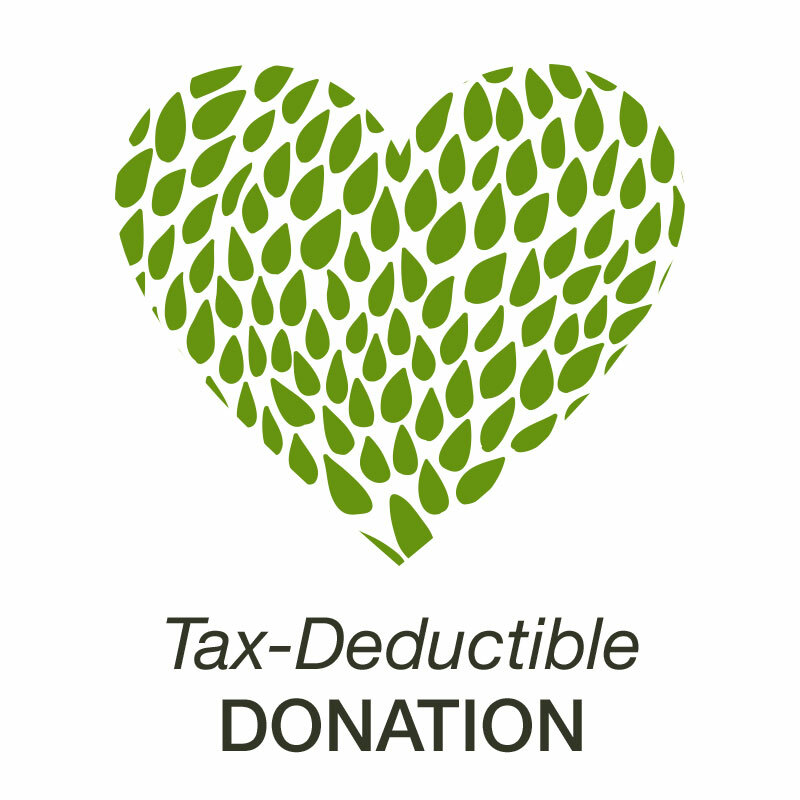 It is also a member, as is the Village and the Town of Pelham, in Sustainable Westchester. Interest in sustainability and environmentally-friendly policy is growing in Westchester, and an SAB can serve as a crucial linchpin, connecting the ideas and desires of citizens to improve their communities with the municipalities that can help enact them. Village of Pelham residents interested in serving on the proposed SAB can contact ariel.spiracohen@pelhamgov.com or xaira.ferrara@pelhamgov.com. In October, the youth group at Huguenot Memorial Church planned an event for 50 people with a key goal in mind: to generate zero waste. 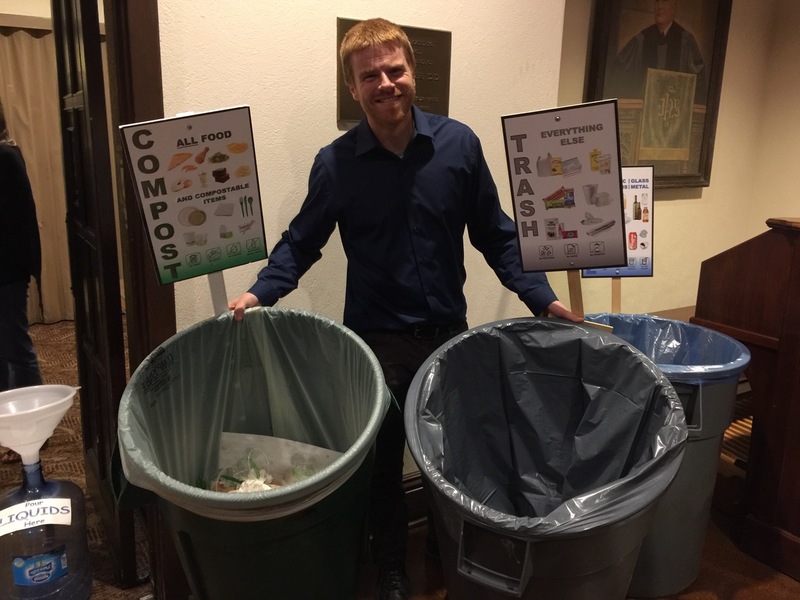 According to Associate Pastor Jacob Bolton (above), the organizers asked the caterer – Modern Restaurant in New Rochelle — to deliver the food in recyclable foil tins and avoid using plastic wrap. They clearly marked bins for recycling, composting, and regular trash. They even enlisted the help of Scarsdale’s composting activists to haul away the food scraps, since Pelham Manor does not have its own community food composting program. “What everyone realized throughout the night was nothing was going in the garbage,” Bolton said. As we enter this month of gifts, galas — and garbage, you might give some thought to planning your own zero-waste gatherings. The Environmental Protection Agency says Americans create 25 percent more waste during the holiday season than they do the rest of the year. While it’s hard to completely eliminate wrapping paper, boxes, and holiday cards, at least they’re recyclable. Use e-vites instead of paper invitations. Hang LED Christmas lights instead of incandescent lights, which use ten times more energy. Also consider reusable or natural decorations. Those pinecones littering your lawn could make the perfect centerpiece. Set the table with cloth napkins, china, and regular silverware – nothing plastic or paper. Serve hot beverages in ceramic mugs, rather than paper hot cups that actually aren’t recyclable because they are lined with a thin plastic coating. Turn down the heat. Once the guests arrive, they’ll warm up the house for you. Let your guests in on the zero-waste theme early. If they are bringing food, they, too, can use eco-friendly containers. Give the leftovers to your guests or to someone in need. Before tossing out those picked-over poultry carcasses and ham bones, squeeze out more nourishment by making soup stocks. Compost, if possible. If you have a bin in the backyard or other eco-solution for disposing of food scraps, paper towels, and coffee grinds, you have a much better chance of hitting the zero-waste mark. When it comes to pollution, the plastic straw is an afterthought. But it shouldn’t be. In fact, the humble straw creates big environmental problems. As the students involved with Pelham Eliminates Plastics noted at their October launch event at The Picture House, people in the U.S. alone use 500 million straws per day. (Source: Be Straw Free.) If such plastic habits don’t change soon, by 2050 there will be more plastic in the ocean than fish. Straws are one of the plastic products PEP is targeting in Pelham. “They’re bad for the environment, and they hurt all the wildlife,” said Russ Eustace, a sixth grader at Pelham Middle School who is a member of PEP. Several local businesses have attempted to tackle the plastic straw problem by testing out paper versions. Unfortunately, that’s not yet a great solution. Clay Bushong, an owner of Cantina Lobos on Wolfs Lane, said his restaurant has tried three different types of paper straws. In addition to costing more than the plastic variety, paper straws were not a big hit with customers, as they tended to disintegrate in the drinks. Lisa Neubardt, owner of the Bakery at Four Corners, said she, too, has not found a viable alternative. “If there was a product that was economically feasible and sustainable, I would use it,” she said. The bakery does try to conserve in other ways, such as by not handing out too many napkins, she added. If you must have a straw and want to avoid plastic, you could always carry around your own, made of a recyclable material such as bamboo, glass, or metal. But the easiest thing to do, whether ordering a drink from a restaurant or takeout counter, is to just say no to the plastic straw. As Russ Eustace said, “They’re really unnecessary.” Think about it. 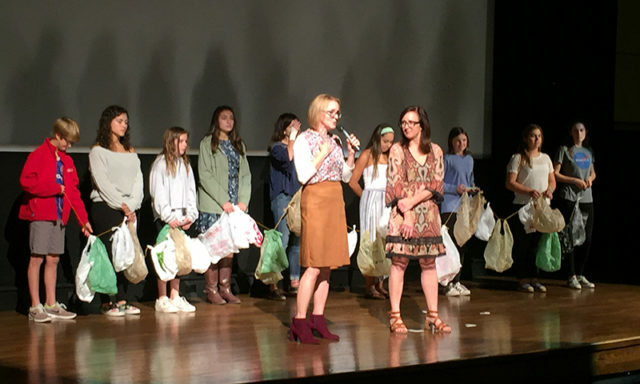 Journalist Lauren Paige Kennedy and editor Tracey Minkin of Coastal Living magazine introduce a teen-led initiative to stop the use of throwaway plastics in Pelham. We’d like to introduce you to PEP (Pelham Eliminates Plastics), which aims to school parents, teachers, neighbors, merchants, and friends about the FACTS on plastic waste and what it’s doing to our threatened oceans. The group takes its inspiration, in part, from Melati and Isabel Wijsen, sisters from Bali who organized a kids’ crusade that shamed the governor into phasing out all plastic bags on the island by 2018. Please take the #PEPpledge: Stop using SINGLE-USE PLASTICS, including plastic bags, water bottles, straws, and takeout coffee lids, TODAY. For our kids’ sakes, and their futures! You’ll learn why in Lauren Paige Kennedy’s COASTAL LIVING Magazine feature, Meet 13 Ocean Heroes Fighting to Save our Seas. For this story she met with musician and ocean conservationist Jack Johnson and a global tribe of scientists, citizen activists, and sea legends, who together crunch the numbers on what plastic waste is doing to our planet—and who also share what we must together do: save our waters one person, one town, one state, one country, and one nation at a time.